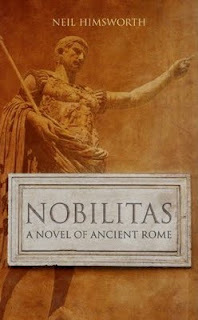 This book is a hefty, rich looking volume whose cover proclaims: A Novel of Ancient Rome. In fact, this story isn’t about Rome at all, but Britannia in the year 470 at the end of Roman rule. After the withdrawal of large numbers of Roman troops in AD 407, the islands are threatened from within by inter-tribal conflict and incoming ships crammed with Saxon invaders. The remaining legions face a dilemma: to stay on the island where they grew up and raised families, or accept the will of Rome and return home. Mannius, a trained surgeon and veteran of the legions, chooses to stay in his new homeland, hoping to continue his career. However, when his uncle, the governor, is murdered, Mannius finds the weight of responsibility has been passed to him and the Votadini turn to him for deliverance from the rampaging Picts. Within the first few pages of this story, we are thrown into an attack by the Picts on the Votadinis at Traprain Law, near Sin Eidyn. Both places are north of Hadrian’s Wall, so they were always going to be trouble. The fighting doesn’t take long to erupt in full flow and it is soon evident that the entire story is written around the conflict between the outgoing Roman soldiers who try to maintain a tenuous grip on their occupied land, and the internal fighting where the Picts want to kill the Votadini and the Brigantes, the remaining Romans don’t mind who they kill, and an incoming wave of Saxon invaders want to kill everyone. I was thrown right into the fighting, even before I had a chance to work out the characters, or whose side they were on. After a while though I stopped cheering on the Picts [Eastern and Northern Scots] and Votadinis [Lowland Scots] to concentrate on Mannius’ the surgeon, who finds himself in the middle of a war not of his making. The female element appears in the form of Princess Caoimhe of the Votadini, who loses her father in the first wave. A young widow with a small daughter, her enquiry of the local wise woman as to whom she might marry next, is interrupted by the Pictish invasion. Caoimhe dresses like a man in preparation to fight for her tribe. Another female distraction is Mannius’s aunt, Felicia, widowed, Britannia hating and out to seduce her nephew. Eithne is Mannius’ devoted slave who is jealous of Princess Caoimhe. Then there is Taran, a druid and his apprentice Una who have their own agenda. Neil Himsworth paints an authentic and emotive picture of a disturbing time, with a good characterisation of soldiers, legionnaires, invading hordes, tribal royalty and slaves. The Britain of 470 is a place where men’s rights were governed only by which army they had behind them in a land tired of Roman dominance, where as ever, the weakest suffer the most.